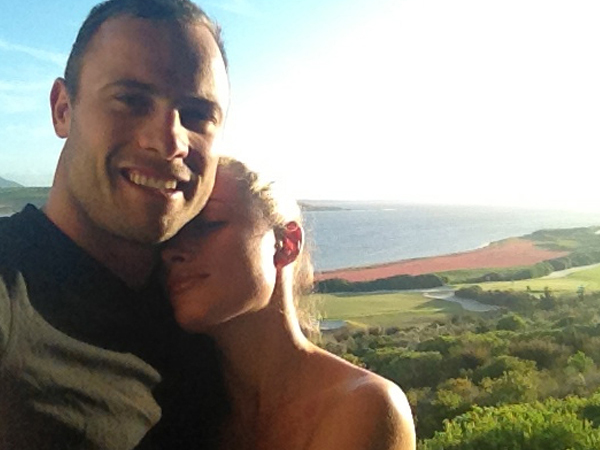 Oscar Pistorius is seen kissing and flirting with Reeva just days before he shot her dead, in security footage. South Africa's Oscar Pistorius is seen kissing and flirting with his model girlfriend just days before he shot her dead, in security footage broadcast on Saturday ahead of his murder trial. Pistorius and his girlfriend Reeva Steenkamp behaved like any loving couple as they picked out groceries at the upmarket Woolworths store in Pretoria ten days before her Valentine's Day death, according to CCTV images broadcast by Sky News. The two were browsing the food section just before 10:30pm on February 4 last year. Blissfully unaware of the security cameras, they chatted and laughed, relaxed and at ease with each other. At some point the athlete leaned over and kissed Steenkamp. Prosecutors have charged the 27-year-old Paralympian hero with the planned killing of his lover. The state is expected to show the couple had relationship problems, and call as witnesses neighbours who heard fighting and screaming the night of the shooting. But Pistorius has insisted they were in love and that he shot his 29-year-old girlfriend through a locked toilet door at his home believing she was an intruder. His trial will open Monday and is to be broadcast live. It will last at least three weeks.